Reducing the interest rate on your debt creates instant savings. But what are your options when it comes to reducing your rate? While you can try negotiating a better rate with the lender, there are other options that can have a higher chance of success. 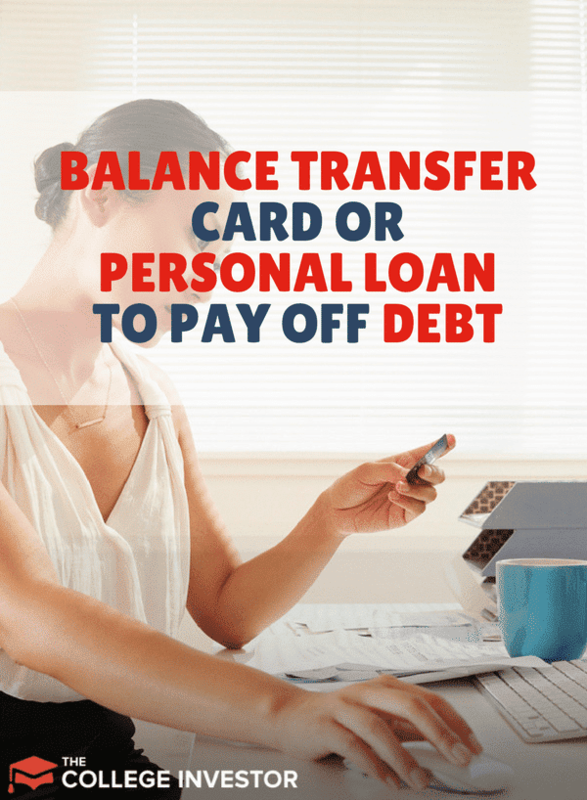 We’re going to compare balance transfer cards to personal loans for paying off debt. Compared to high-interest debt, these two options provide lower interest rates, more manageable debt payments and ultimately increase your chances of paying off debt (we’re going to assume credit card debt). Right now, there are several cards offering 0% APR for balance transfers, including the Chase Slate. Learn more about the different balance transfer cards here. A balance transfer card is a credit card that has a promotional offer available on balance transfers. If your credit score is over 700, you’re probably being inundated with these offers already. However, even with a score just under 700, you should still be able to find a balance transfer promotional. While your existing credit cards may send out balance transfer offers, you can also apply for a new credit card that currently has an offer running. If possible, it’s best to try and utilize an existing card’s offer, which avoids negatively impacting your credit score since you don’t have to open a new account. Promotions can run from 6 – 18 months with 0% interest. You only pay a transfer fee based on the amount being transferred. Fees range between 3% to 5%. However, many promotions also waive these fees! Once a balance is transferred, only the minimum amount needs to be paid each month. It’s best to immediately setup auto payments, so you don’t miss a payment. Depending on the promotion’s agreement, missing a payment can kick you out of the promotion. This means the card will begin charging interest on the balance at the regular rate, which can be well north of 15%. In some cases, the credit card company might apply interest retroactively. Balance transfer promotions use to retroactively apply all interest if the balance wasn’t paid in full by the time the promotion ended. That is not as common now. But be sure to check your promotional agreement for verification. For our comparison with a personal loan, we’re going to assume an 18-month promotion at 3% on $10,000 with no missed payments. The monthly payment will be 1% of the outstanding balance, which is common across credit cards. Our total cost will be $300. Monthly payments will start at ~$100/mo and slowly decrease as the outstanding balance decreases. To keep things simple, over 18 months, we’ll pay roughly $1800, bringing the balance to $8500 ($8200 + $300). For this particular promotion, it isn’t necessary to pay off the balance. We can find another promotion for it. In summary, we financed $10,000 at a total of 3% in fees. Not bad at all. Because the personal loan requires 36 months, we can use another 18-month balance transfer card at 3% on the $8500 balance, resulting in a fee of $255. The total cost across 36 months then comes to $555. And remember, if you can get a 0% APR balance transfer card, that has no fees, then really you do pay $0. See if you can find a balance transfer card here. In contrast to using a balance transfer card, a personal loan will charge ongoing interest and can have setup fees. We’re going to use the same numbers from above for our loan, but the fees will be different. We’re going to use rates from Credible Personal Loans. Most personal loans don’t have fees for the following: Origination, closing, and pre-payment penalty. The average APR is 13.99% based on a FICO score between 670-739. Total payments across 36 months equal $12,312. The big difference here is that our loan is paid off after 36 months. With the balance transfer card, we have approximately $7225 ($8500 – $1530 + $255) remaining. The Discover Personal Loan cost us $2,312 to pay off $10,000, or 23.12% of the total debt. While the balance transfer card had lower monthly payments, after $555 in fees, we still have a balance of ~$7225. The question here is: If we increase the balance transfer card’s monthly payment to $342 from the beginning, what happens? Total payments after 18 months are $6156, leaving a balance of $4144 ($10300 – $6156). Because the second 18-month balance is only $4144, the fee drops to $125. We now start paying on $4269 ($4144 + $125). After just one year, the balance is paid off. In just over 24 months, our balance transfer card is paid off. The total cost is $550 or 5.5% of the debt. Clearly, the balance transfer card comes out ahead. As a bonus, you could have extended the balance transfer card by going into another promotional after 36 months, keeping lower monthly payments, assuming you need more cash flow. We’ve seen that a balance transfer card can be a great way to pay off debt because of its low fees. One caveat is that we used Credible as the personal loan provider, which might not compare as favorably to a credit union personal loan. However, we like Credible for personal loans because they compare the best options for you. Check out Credible here. The bottom line is, if you can get a 0% APR credit card, with no fees, that’s typically the best way to go. If you can’t, or you’re going to be paying off the loan for more than 2 years, a personal loan might be the way to go.